End of an era arrives as studio is taken over by Disney. On Wednesday, a new day is dawning in Hollywood – for better or worse. Parts of 21st Century Fox – including its film, television studio, thirty percent of Hulu, and other operations are to become the property of The Walt Disney Co. in a $71.3 billion deal first announced in December 2017, which stunned everyone in Hollywood. After all, it was a deal no one ever thought would be made – after all, Fox and Disney once had a spirited rivalry, coming to a head in the early 1990s when the Fox network and Disney’s Buena Vista Television battled over children’s programming in key afternoon time periods. But it’s a far different scenario today. All of the major studios are under attack from Silicon Valley giants such as Apple, Amazon, Google, Facebook, and Netflix – especially Netflix. Television ratings continue to drop as more and more viewers are tuning in to alternatives. The film business is losing steam as Netflix has jumped into the motion picture business (as evidenced by Roma’s success at the Academy Awards – even though it didn’t win Best Picture.) It is not the same business at it was thirty years ago – or even five years ago. As of 11:02 p.m Central Time tonight, Disney officially takes over the studio while Fox forms a brand new company, called Fox Corporation. The entity consists only of Fox News, the Fox entertainment network, Fox News, Fox Business Channel, FS1, FS2, My Network TV, and the Fox-owned and operated stations, including Chicago’s WFLD and CW affiliate WPWR. The new Fox started trading today on NADSAQ (FOXA). Temporarily, Fox’s regional sports networks now move under Disney’s ownership and the channels must be sold 90 days after the Disney-Fox deal, beginning tomorrow. Very little movement has occurred on this front so far, aside from the New York Yankees coming close to re-purchasing YES with Amazon and Sinclair possibly being partners. 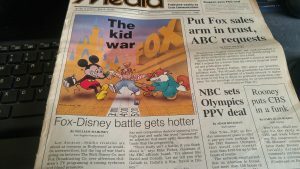 Retro battlelines: Both Disney and Fox were once involved in a fight over kids’ afternoon time slots. This cover is from the February 12, 1990 issue of Electronic Media. Fox Corporation launched its new website Tuesday, a bares-bones site featuring its portfolio. The new Fox also won’t have a syndication division at start, with Twentieth Television now being absorbed into Walt Disney Direct-to-Consumer and International. Rupert Murdoch was named co-chairman of the new company while his son Lachlan was named chairman and CEO. Named as board members are Fox veteran Chase Carey and former Speaker Of The House Paul Ryan, a move certain to stir up controversy. Indeed, the moves mark the end of an era. 20th Century Fox’s roots date back to at least 1915 and the company in its current incarnation was formed in 1935. The studio formed a TV division in 1949 and cranked out hits such as M*A*S*H, Dobie Gillis, Lost In Space, L.A. Law, and The Simpsons. In 1985, Australian media mogul Rupert Murdoch bought the studio and a year later, purchased Metromedia’s six TV stations (including WFLD) to form a basis for the new Fox network, set to launch in 1987. Since then, Murdoch stunned the media world numerous times – acquiring NFL rights, then striking a deal with New World Communications’ twelve Big 3 affiliates to switch to Fox. In 2000, he would do so again, taking advantage of the FCC’s just-loosened duopoly rules by buying Chris-Craft’s eight TV stations, the core of UPN who would later become My Network TV outlets after the network folded in 2006. Murdoch would later acquire the Wall Street Journal. In 2013, Murdoch’s News Corp. separated from the TV and film studio, the latter becoming 21st Century Fox. In the last decade, it was clear Fox had an identity crisis as Fox News Channel – known for its conservative lean and support of President Trump, became a beast in cable news – overshadowing everything else the company was known for, including Fox’s own broadcast network and film studio. Several showrunners of Twentieth’s programs spoke out against Fox News’ open support of Trump’s policies, including Family Guy’s Seth MacFrlane and Modern Family’s Steven Levitan. It also appeared Murdoch was never really a fan of Hollywood, whether if it was the business side or the perceived left-liberal leanings of Tinseltown. But he didn’t mind letting the different divisions of News Corp. go at it, with The Simpsons and Family Guy regularly criticizing Fox News on their shows. So while Hollywood mourns the passing of a great studio, it’s just another reminder of how life is in this new media environment were in. 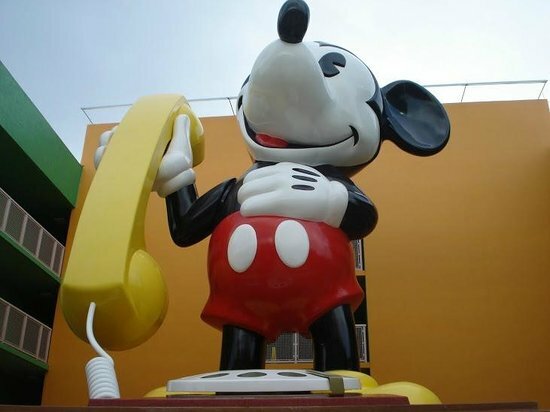 Now nearly forty percent of it controlled by a giant rodent.